Every episode of the hilarious anime redub Dragon Ball Z Abridged opens with a disclaimer imploring the viewer to support the official release. Since the actual anime dub voices sound wrong for me after Abridged, I’ve decided to take on Dragon Ball Z as my first manga review for Collected Editions. There are different schools of thought on how to get into manga from Western comics and different choices for first books; Dragon Ball Z has the advantages of being well-known and of feeling superheroic enough to bridge the transition from Western to Eastern. However, Dragon Ball Z has the unusual distinction of being a first volume and a seventeenth volume. What we refer to as “Z” is the second half of Akira Toriyama’s long-running manga Dragon Ball, which adapted a classic Chinese novel, Journey to the West, into the story of a monkey-boy training to fight in martial arts tournaments. This first half of the story didn’t catch on when imported to the United States in the mid-1990s, so instead, when the manga jumped five years ahead, so did the dub company. 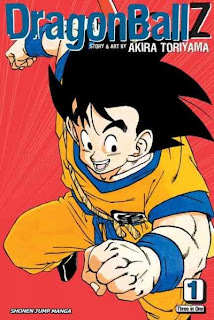 Sometimes, when comic book companies claim that a certain book is a “jumping-on point,” such a claim is tenuous, but Akira Toriyama worked hard to accommodate new readers starting with Dragon Ball Z. The Three-In-One version reviewed here contains the first three volumes of Z. As a result, the first few chapters collected here change the entire concept of the book. The lead character, Goku, is revealed to be an alien; this information comes from his evil older brother, Raditz. Many of the magical aspects of Dragon Ball are removed and replaced with science fiction tropes. Various plot holes caused by these changes -- like Goku’s teacher Kami not realizing that he’s been an alien all this time -- are brushed aside by the rapidly-shifting plot. Pretty much all connections to Journey to the West are lost in the change, with many of its analogues in the manga either moved into minor roles or removed entirely. Many of the previous Dragon Ball characters who do have important roles are not well-introduced and die within pages of their introductions. I don’t really consider their deaths a spoiler, since the impermanence of death in Dragon Ball Z is a key theme. The titular balls can be brought together to summon a wish-granting dragon, who is often used to resurrect characters. Goku spends nearly two-thirds of this three-in-one volume in the afterlife, which has an intriguing mix of American and Japanese mythological influences. Toriyama inspired generations of manga-ka (manga writer/illustrators) to blend sci-fi, magic and myth; series such as Naruto, One Piece and Bleach owe a lot to Dragon Ball Z. This is also true of their lead characters, as Goku is one of the most prominent “idiot heroes” in fiction. American comics featuring young heroes tend to make them intelligent despite their age; consider Spider-Man’s scientific knowledge or Tim Drake’s detective skills. Goku is a fantastic fighter and a very sweet, brave and dedicated person … but he is not smart. When the other characters find out that he has a son, they are shocked that Goku could have figured out how to breed. Gohan is the series’ secondary protagonist, forced to train under Goku’s arch-enemy, Piccolo, after his father died to protect him. Piccolo’s tutelage is harsh, to say the least, but since Gohan has alien strength, it mostly comes off as funny rather than abusive. Viz’s translation is well-done, if a bit odd when it comes to some of the names. Many of the teacher characters have their honorifics kept in the original Japanese; for instance, King Kai is referred to as “Kaio-Sama.” The Saibamen henchmen are referred to as “the Cultivars.” The most notable example is that Goku’s best friend, the short, noseless Krillin, is rendered as “Kuririn.” This is phonetically correct (the word is a pun on how he’s a Shaolin monk with a head like a “kuri,” or chestnut), but odd to say. Nearly every name in Dragon Ball Z is a Japanese pun, an English word, or a Japanese pun on an English word, and the translators did a good job keeping these intact. The dialogue flows as naturally as dialogue in a fighting manga can. There’s more or less an entire volume between Goku’s death and his resurrection to fight two more alien invaders. This drags on after a bit, but the reward is the appearance of the two Saiyans. Vegeta and Nappa are two of the most famous characters in the series, although Nappa has taken on new fame thanks to Abridged. The final chapters feature the famous “It’s over 9,000!” scene, although it’s the more translation-accurate “8,000” instead, and it ends just as the fight between Goku and Vegeta begins. This is actually kind of a relief, as the fight against Nappa takes quite some time. Toriyama’s art style is striking and immediately recognizable. He has some noticeable quirks, such as either an inability or a refusal to draw normal hair. Most characters are either bald (like Nappa, Piccolo and Kuririn) or have huge hairstyles (like Goku, Vegeta and Raditz). At times, the characters change height in relation to each other, especially with Nappa, who, while large, is nowhere near as tall as he seems to be in his final fight. A handy character identification chart at the front gives some clues as to how everyone should stack up. The Three-In-One edition used for this review brings you a huge amount of story for about the price of less than two individual volumes, and it includes the original chapter title page artwork and other bonuses. I was pleasantly surprised that, despite being almost twenty years old and not featuring the Abridged series’ humor, Dragon Ball Z still holds up as a fun read. It’s a good way to get into the world of manga whether or not you’ve seen the anime.